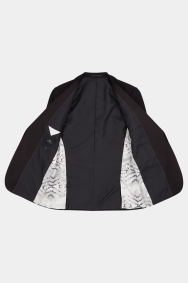 A sharp jacket to take you from prom night to seasonal balls. Style is all about the detail, and this jacket has plenty of them. The satin peak lapels are edged in velvet and it’s cut in a close-fitting skinny fit to give you an on-trend defined outline. It has all the elements of a classic dress jacket, like the single-button fastening and satin detailing, to make sure you look the part for formal dress codes. 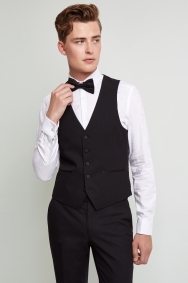 Complete the black tie look with black pants, a vest and a bow tie, all contrasted with a white dress shirt. Great cut and shape and looked the part. Fit perfectly and was different and stylish to more traditional suits. Great quality with accurate fit-nicely lined! Good fit for an evening dinner! Beautiful suit and very different to a lot of the high street usual ones. Fit perfectly and the service was good. They gave good advice on tailoring. Lovely fit and even better once taken in slightly. Excellent jacket - perfect fit and really nice. 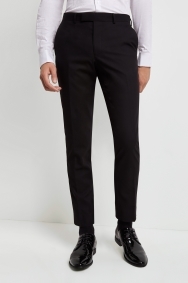 The trousers were a perfect fit and the material was of good quality.